Stephanie Garcia doesn’t have time for a nap, and she likes it that way. She typically wakes up for a sunrise breakfast before her 9 a.m. practice. After a few hours of running, dynamic exercises, and hurdling drills, it is time for lunch. After lunch, Garcia seeks out a massage, a chiropractor, or physiotherapy before heading to a second practice filled with more running, a weight session or a pool workout. If there is indeed a nap in there, the 27-year-old professional runner — a steeplechaser — doesn’t mention it. Her coach, Robert Gary, confirms this tendency in Garcia, describing her as a “confident worrier.” She is always “trying to add things because she really wants to make sure she is doing everything possible,” he says. Gary is both Furman’s men’s and women’s cross country and track coach and the founder of Furman Elite, which supports eight athletes, including Garcia. It took Garcia some time, as it happens, to refine her schedule and understand everything that goes into the professional runner lifestyle. And in this Olympic year, the coach and athlete have been trying to dial in on the tasks that will have the biggest impact for the Olympic track trials in July and, if all goes according to plan, the Rio Olympic Games in August. Garcia is also trying to manage her own expectations. “Olympic years are emotional years,” she says. Garcia doesn’t fill in the sentence. “I’m just talking,” she says. “I’m kind of blabbering. I’m trying to make myself buy into this here” — which is the idea, I suppose, that she could rebound from her dream not coming true. What Garcia is trying to say, in a sense, is that she’s not necessarily used to being among the favorites. It wasn’t perhaps until after last year — when she was second in the country and made her second world championships team, among other things — that she really could put that stake in the ground. Either way, the path Garcia has followed is remarkable. In 2005, her senior year at Broad Run High School in Ashburn, she placed sixth in the Virginia High School League AA Girls State Cross Country Championships. Her track results were not noteworthy. Ten years later, in the national championships final, on a hot day, Garcia found herself in the lead right from the gun. The first lap was slow. But rather than slow it down more to coax someone else to take over the lead, Garcia went with it and ratcheted up the pace. As the race got rolling, Garcia had those following her on pace to run 9:20, a time the television announcers noted was PR pace, in what was supposed to be a tactical race, for everyone except four-time national champion Emma Coburn, who was tucked right behind her. When Coburn made her move, Garcia went with her, hanging on long enough to gain separation from the rest of the field. She held on for second in a huge personal best of 9:23.48. 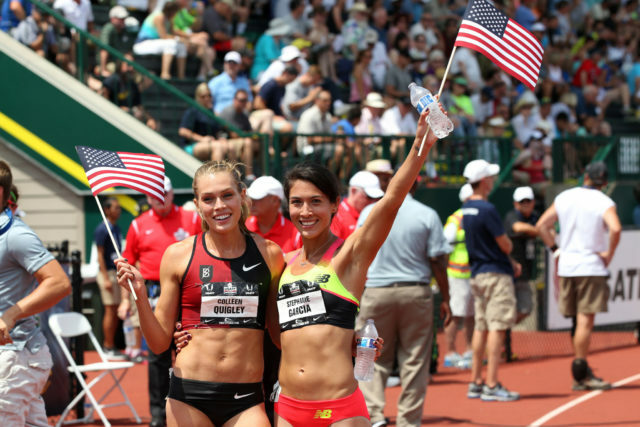 That day Garcia went from someone who once finished sixth in her high school state meet to the fourth fifth fastest American ever in the steeplechase. Later that summer, she finished ninth in the world. The steeplechase holds the distinction of being described by Wired magazine as track and field’s “coolest race you’ve never heard of.” Yet, in the minds of those who run it, it’s the only track race that matters. The 3,000-meter race is held on an outdoor track and measures out to seven-and-a-half laps — so slightly less than two miles. Before the gun fires, four barriers, huge hurdles, are dragged out onto the track. The water pit at the top of the curve that leads into the homestretch suddenly has a purpose, and at some meets, like the Penn Relays, rowdy track nerds will gather in stands closest to this area fully hoping to see a wipeout or two. When I was in college, I remember one outdoor track meet where the steeplechase was the first event. It was a very cold day in March. Minutes before the gun fired, the officials went over to the pit and broke up the ice that was covering the pit. One of my teammates was in the race, and I still remember gasping when, with more than one lap to go, he tripped over the water barrier, went fully submerged in the icy water, and popped out soaking wet on a 30 degree day. But even after that, nothing changed. It wasn’t so much that he thought the steeplechase was his best event. He simply had no interest at all in running anything else. To those who choose the steeplechase, to runners like Garcia, track and field is one event — and that event is this tribal test of speed, endurance, and athleticism. Starting in fifth grade, Garcia was chosen to compete in annual mile races pitting Loudoun County’s fastest elementary school milers. “I liked lining up against good people and seeing if I could beat them.” One year, in seventh grade, she did, and this drove her to focus on running in high school. Her goals were modest. She wanted to be the best freshman or make it to states, “all those kinds of goals you have as a high school runner,” she says. And in a way, having no idea helped. Maybe Garcia didn’t know what high-level running was like yet, but she still saw herself as someone who would run at a high level in college. If Garcia were in tune with the Dyestat world, she might have seen there was a spot waiting for her on a Division III team. Instead, Garcia visited the University of Virginia, where she was lightly recruited. After she got in on her own merits, she let then-UVA coach Jason Dunn know about it. He simply said he would see her in August. There was a spot on the team waiting for her to earn. At this time the women’s steeplechase was still a new event in NCAA track. It had been introduced just a couple years earlier and would debut in the Olympics in 2008. In that freshman track season Garcia qualified for the NCAA championship and won a junior national championship, though the result, as impressive as it was, could almost be taken with a grain of salt. Her time was 10:26.41, whereas back-of-the-pack professional times were at least under 10 minutes. But Garcia was only getting started. As she honed in on her event, her focus shifted away from cross country and indoor track to being able to run her best in June. And after an injury in her senior season led to a fifth-year season of outdoor track, Garcia made the best of it. She broke 10 minutes in her first race of the season, finished as runnerup at NCAAs, and took fourth in the national championships to qualify for the world championships in Daegu, South Korea. In Daegu, Garcia did not advance to the final. She did, however, gain a mentor in her roommate for the championships, Jenny Simpson, who won a world title in the 1500 and who continues to be someone Garcia can count on for advice. In college, Garcia’s method was pretty simple: she listened to her coaches. But in 2012 and 2013, Garcia pinballed back and forth between different coaches and training programs, and her results suffered. Garcia felt like she needed a big change to get back on track. In 2013, she had roomed during a meet with Heidi See, an Australian middle distance runner and member of Furman Elite. Garcia had heard of Gary. She knew he had coached at Ohio State, was then coaching the 2013 national steeple champion Nicole Bush, and was a two-time Olympic steepler himself. Furthermore, the Furman program, which offered access to college facilities, seemed like the right fit. Garcia made the move, ending her less-than-two-year-old marriage with 1500-meter runner John Jefferson in the process. At Furman, Gary designed the college elite program himself and pitched it to the university, he says, partially after seeing many runners struggle to transition from college to professional running. “They quote-unquote run professionally,” he says, without a good support system. As a member of Furman Elite, Garcia, who is also sponsored by New Balance, works with Gary every day and receives monthly installments of training plans arranged on a grid. Even Gary, though, didn’t see Garcia’s 2015 coming — a year in which she achieved Olympic A standards in the 1,500, 5,000, and steeplechase. “I didn’t know she could become that kind of athlete,” he says. It was clear that Garcia, in 2015, took her speed and endurance to higher levels. There is no better proof than when you can run personal bests and world-class times in events that are both longer and shorter than your goal race. Having great training partners, Garcia says, the discovery that she responds well to stints of altitude training in Flagstaff, Ariz., and tough gym sessions have certainly helped in this regard. This year, though, Garcia and Gary have been focusing on her greatest weakness. When you watch Garcia compete, you can see this weakness is not a lack of courage. She puts herself in position for breakthroughs. You can see her draw deep into the well. But if you watch her closely — especially as she and Coburn broke apart from the field last summer — you will see that Garcia is almost forcing herself to be tougher than she needs to be. On the hurdles, Garcia struggles with timing, often stuttering before she jumps and sometimes emerging slowly out of the pit. But as a professional, sufficient doesn’t cut it, and every second counts, which is why Garcia and Gary have made hurdling her the key focus for this year. Last year Garcia would do 45 hurdle clearances in a session. “Now we’re doing 150,” says Gary, who thinks ironing out her hurdle form alone could yield another 10 to 15 seconds of improvement. If she can do that, Coburn’s current personal best, and Simpson’s American record Coburn broke, could suddenly be in reach for Garcia. But Garcia — going back to the task of managing expectations — is also getting better at keeping it all in perspective. But Garcia is also reminding herself that she has a long career ahead of her — and for that she actually has Coburn to thank. Not that long ago Garcia felt like, at 28, she would be “old” for this trials and that 2016 would surely be her last shot at an Olympic bid. When she told Coburn this, the American record holder had other ideas: namely, that Garcia was just hitting her prime. “It was great that she was encouraging me and believed that I have made improvements and that I can keep improving,” Garcia says. For anyone who has watched Garcia go from being one of Loudoun County’s best to competing against the best in the world, that certainly sounds like a safe bet.